Do you feel a nice warm breeze? Perfect day for a boat ride! Trace the word boat and practice alphabet tracing the letter b. Then write a few more b’s and color. 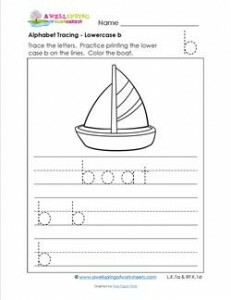 Go to this page to see all the alphabet tracing lowercase letters worksheets in this set.